My friend Maggie has a way with words. She says that attempting to describe my book is like trying to gift-wrap a tap-dancing elephant. She’s captured the dilemma perfectly! In the early days, I struggled to wrap up my content in one or two neat sentences­—an “elevator pitch” as the marketers call it. This is essential, they advise. And of course I want to do things the right way. It’s about money, and how we choose to live in relation to it. It’s about financial sustainability (how we think) rather than just money management (rules and techniques about what to do). It’s about personal growth, with money as the catalyst for conversations and self-awareness. It’s about making the life we want, rather than reacting in knee-jerk fashion to the cultural story about what life should be. It’s about deciding mindfully instead of blindly following roles and rules. It’s about considering the bigger picture rather than having tunnel vision. It’s about insights into the workings and dilemmas of the consumer culture, rather than learning a set of instructions about what to do. It’s about self management rather than money management. Way too many sentences and I couldn’t decide which six to eliminate. Clearly I’m too close to it because everything seems important to me. So I called on the impartial help of technology—in this case a word cloud generator. I fed in my manuscript and let it do its thing. You saw the result at the beginning of this post. I like the word cloud… and it may be the most effective way of wrapping up the multiple interconnected parts and dynamic elements of my book. At the very least, it tickles my imagination…and that’s never a bad thing. P.S. You’ll find the Amazon description here if you want more of the nuts and bolts. The book reviews posted here will give you perspectives other than mine. 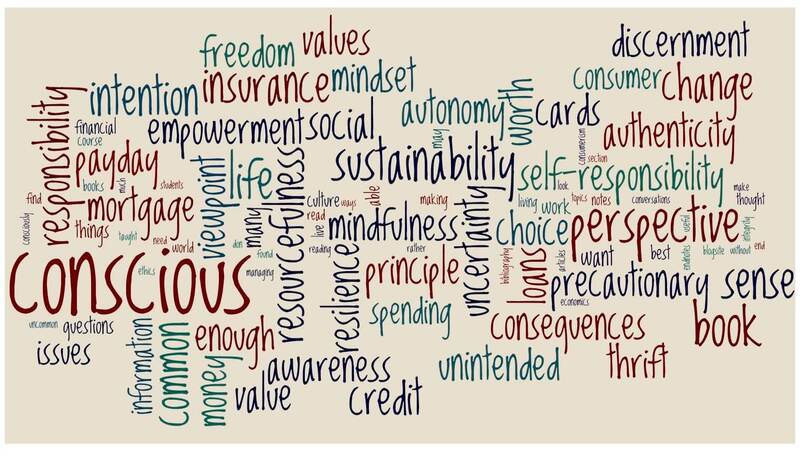 This entry was posted in Information, Action & Being Resourceful, Useful Resources, All Posts—newest first and tagged conscious spending, conscious living, about, intention, deciding mindfully, big picture, self management, financial sistainability, personal growth, making a life, word cloud, money issues by Laurana Rayne. Bookmark the permalink.